A0 Gloss Encapsulated Poster Printing. Laminated front & back with a high gloss film making the colours even more bold & vivid. Posters are printed with fade resistant inks & colour calibrated. 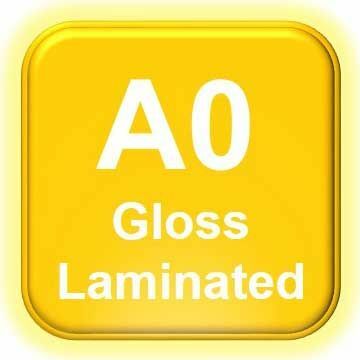 Ideal for Gloss Photo Prints, Gloss Photo Collages, Gloss Presentation Posters, for use with Dry Wipe Markers, A-boards & Outdoor Use. I have been using A1 Posters for a few years now. I've never actually met Chris - he is in Wales and I am in Swanage. But he is brilliant - efficient, helpful, fast and cheap. I am a bit of a last minute person and Chris always works really hard to get my posters out very quickly. A1 are great - use them! I use Chris to print maps for my clients and they're always excellent quality and delivered in a very timely manner. I've ordered many maps from Chris and can't fault the service I receive each time. Highly recommended.